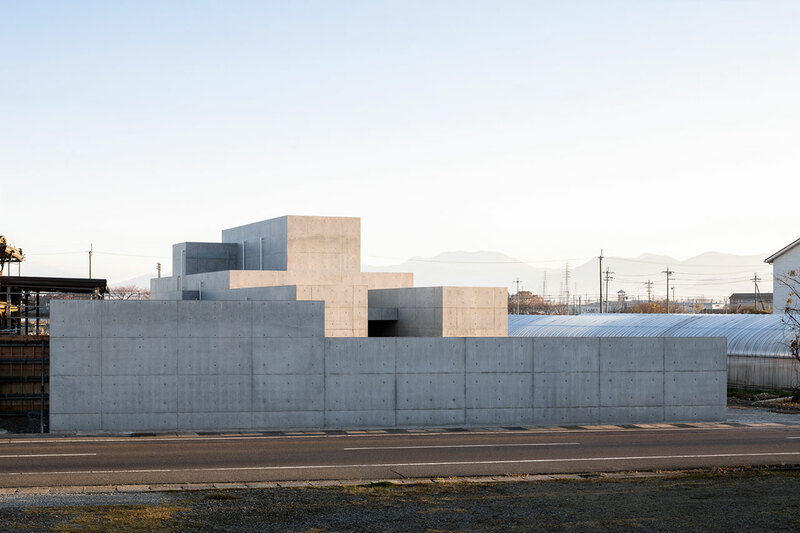 At first sight, you’d be excused if you thought that this ziggurat-like, concrete monolith in Shiga, Japan, is some kind of bunker or utility building, or maybe a fancy showcase for the adjacent concrete factory. 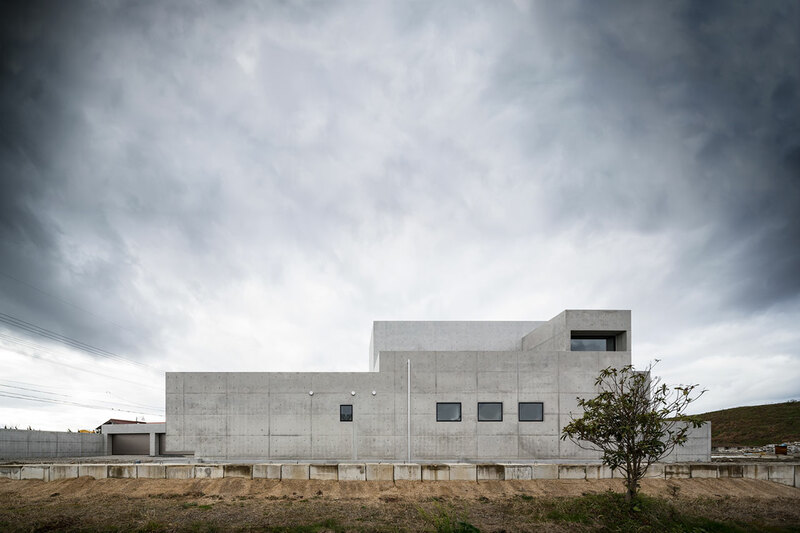 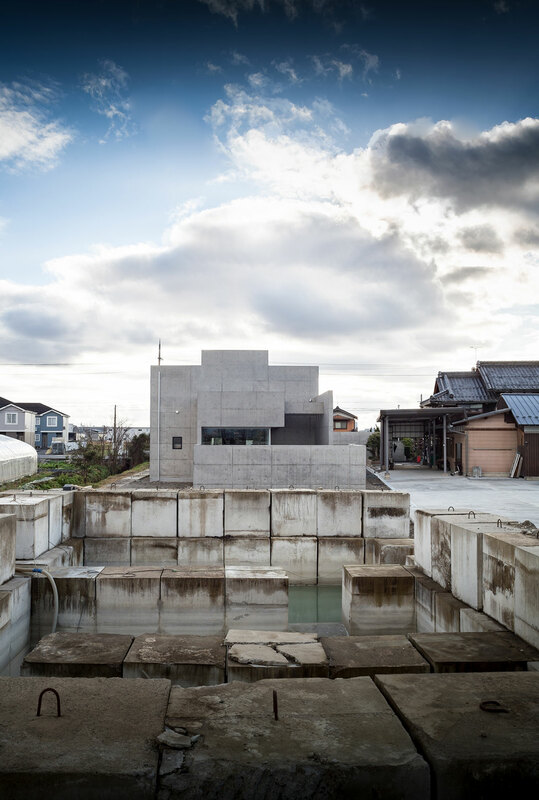 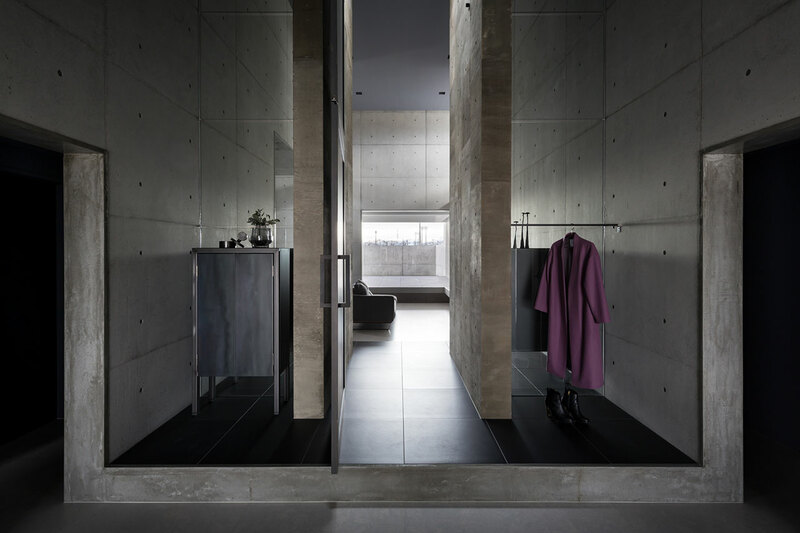 Contrary to appearances, it is in fact a family residence designed by local practice FORM/Kouichi Kimura Architects for the factory’s owner, its “defensive”, introverted form a response to its hectic context. 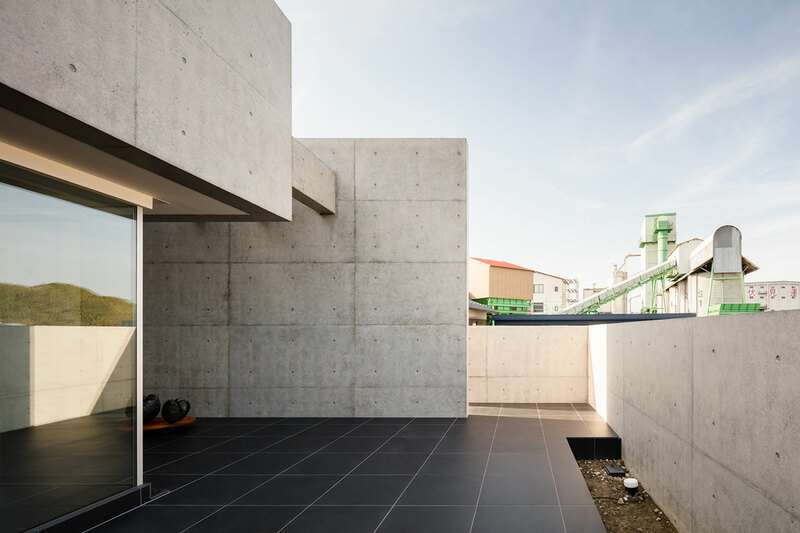 Located next to a busy highway, between a traditional Japanese house where the owner’s parents live and the aforementioned industrial facility, “Tranquil House” turns its back on its surroundings in order to keep out noise and prying eyes. 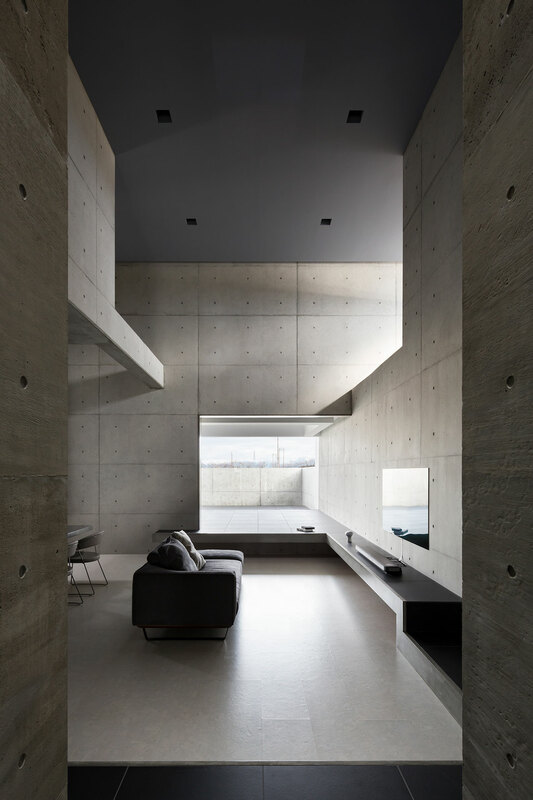 But what the home may lack in views, it more than makes up for in ambience, its temple-like interiors designed as a brutalist tour de force where concrete is sculpted by light and shadow. 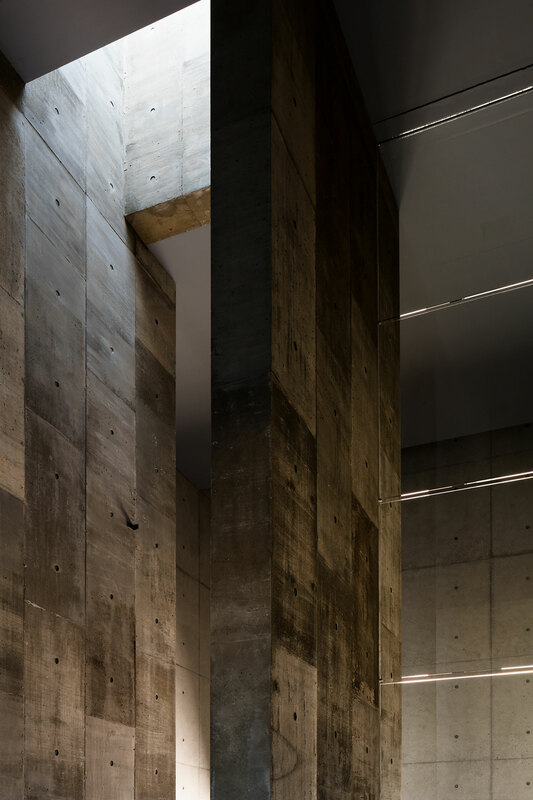 Occupying a narrow plot of land, the building’s brutalist mass unfolds along a north-south axis as a composition of concrete volumes coalescing into what looks like a cubist sphinx-like edifice. 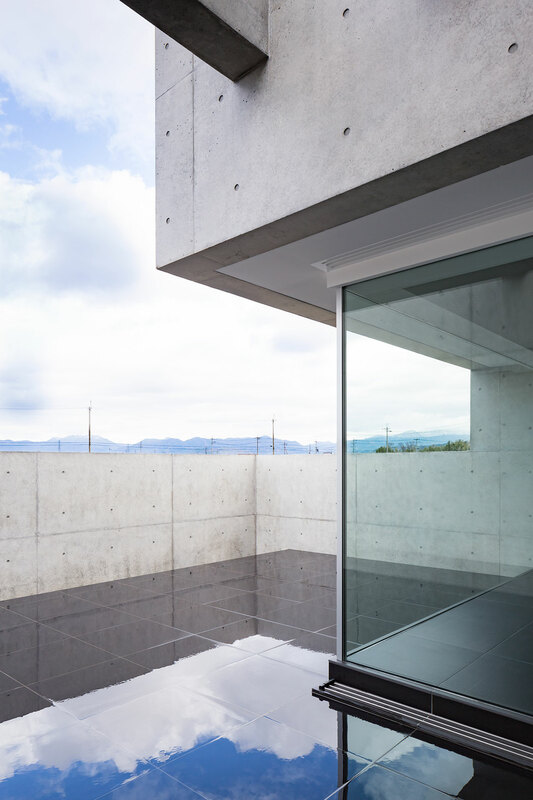 On the south side, the entrance is symmetrically flanked by two protruding windowless volumes that form a ceremonial passageway at the end of which the front door is set between two glazed sections offering glimpses of the interior. 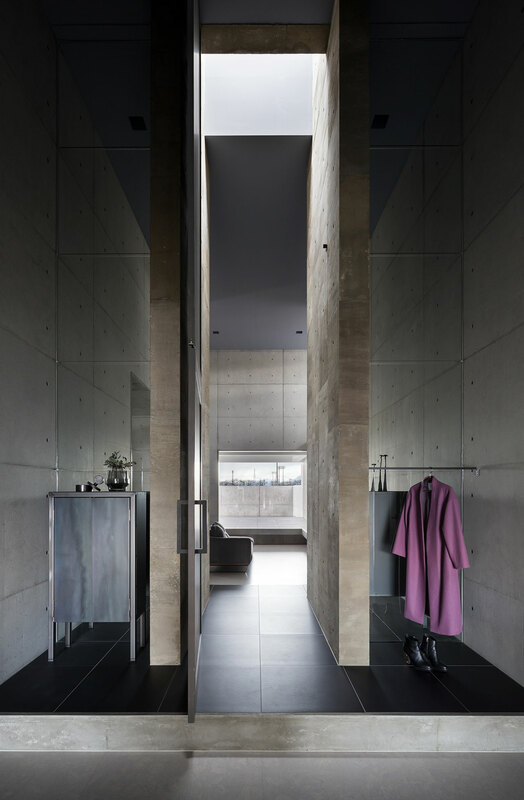 Once inside, you are greeted by an imposing double-height hallway that functions as a connecting node between the house’s three sections: to your right are the private quarters, to your left the wet areas, and straight ahead, through a tall, monumental portal, the living room. 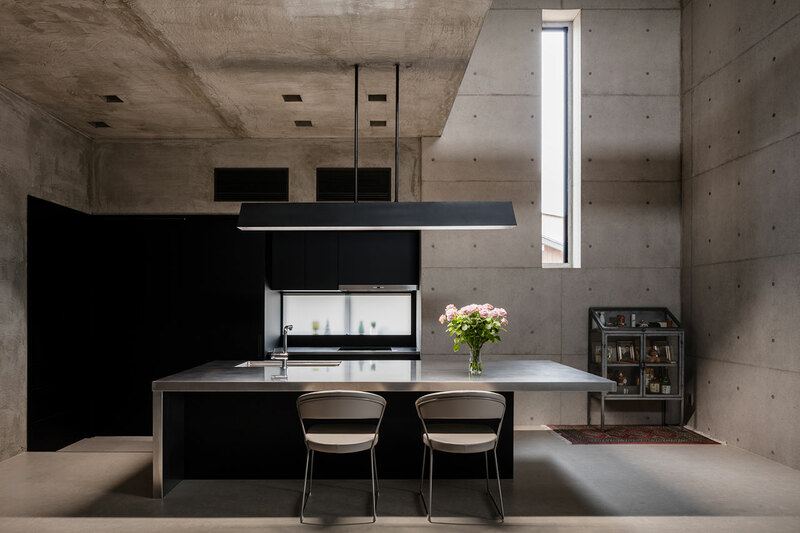 The open-plan living/dining room is a grand space made up of different ceiling heights and floor levels, softly illuminated through clerestory windows that create a temple-like ambience of pious tranquility. 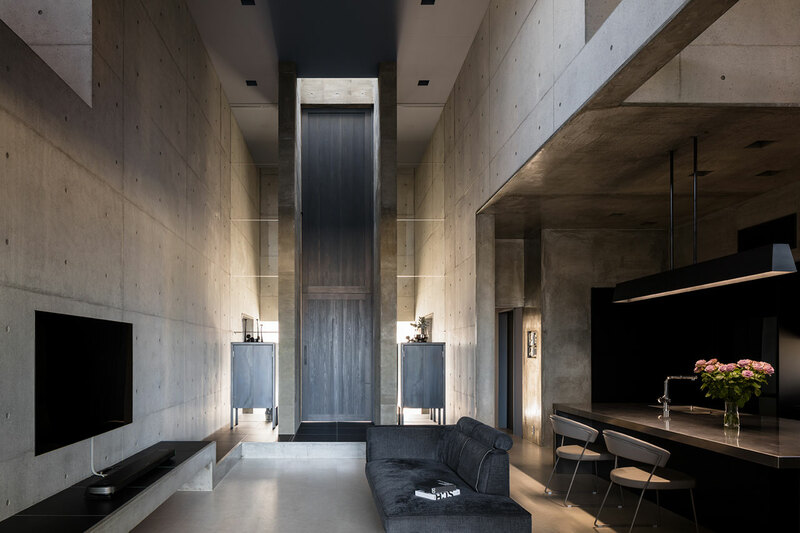 A hidden skylight above the tall entrance doorway further enhances this spiritual sensation while a much brighter area at the other end of the space, slightly raised above the living room level, functions as a conceptual altar. 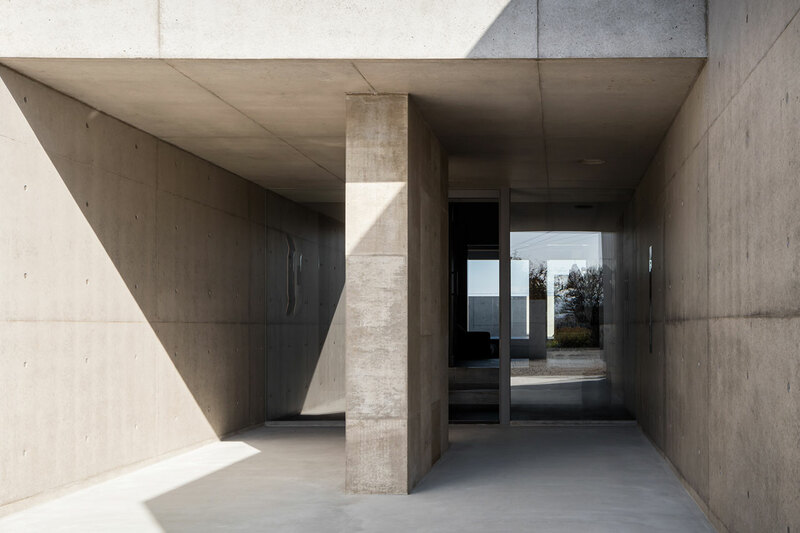 The latter has been conceived as an intermediate space between the solemn, moody living room and the external courtyard at the back of the house that overlooks an empty field, the only area in the house with views to speak of. 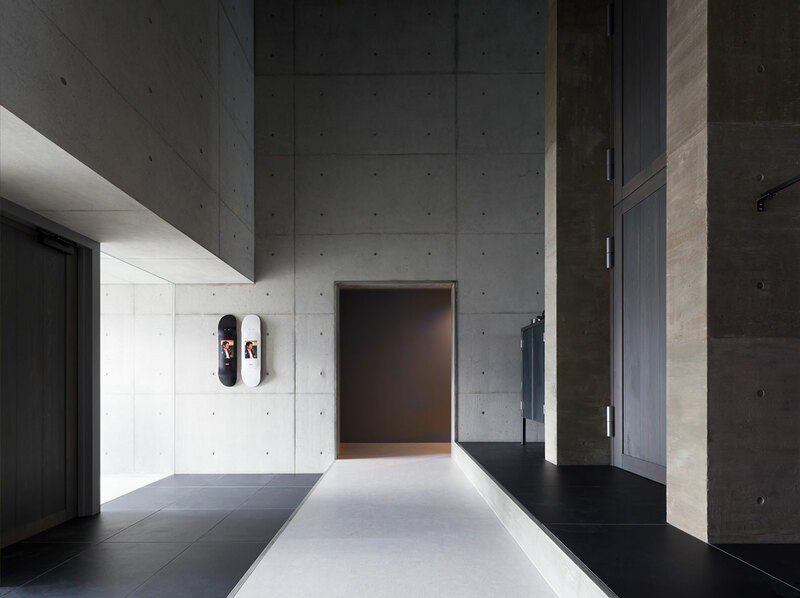 Paved with the same dark tiles as the courtyard and featuring floor-to-ceiling glazing, this area can be used both as a terrace extension in the summer and as a sun room in the winter months. 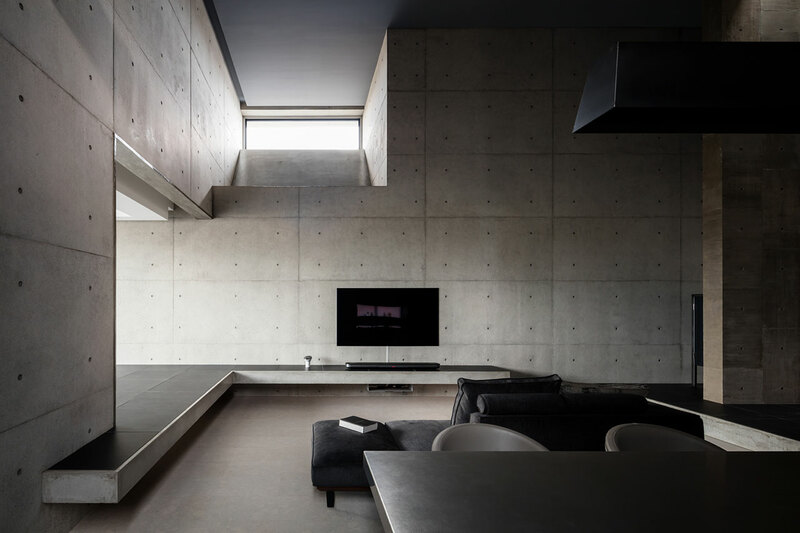 A minimalist décor of trimless fittings, built-in furnishings and a sparse selection of furniture of understated elegance, in conjunction with a muted colour palette, harmoniously complement the brutalist architecture of exposed concrete. 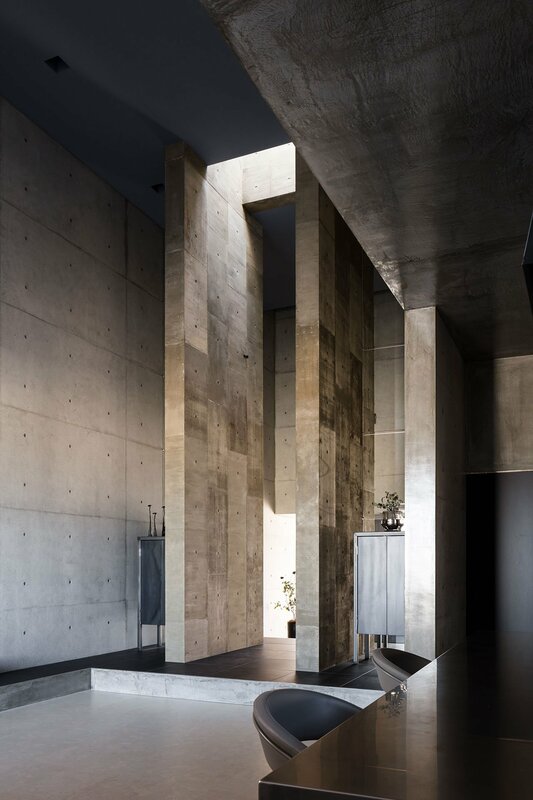 Illuminated by a collection of strategically placed windows of different shapes and sizes, the concrete shell that sculpturally envelops the house’s interior forms a three-dimensional canvas onto which diffused daylight and angled sunlight paint a shifting composition of light and shadow throughout the day. 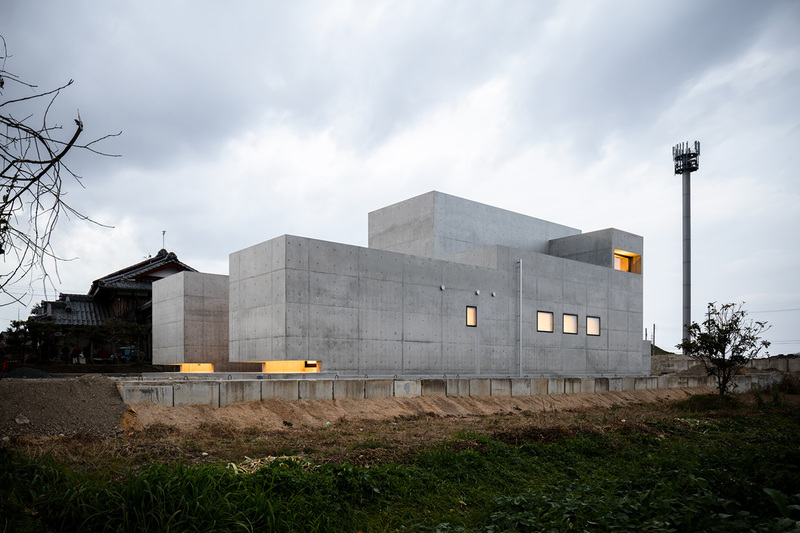 Who needs conventional views of urban centers or trite landscapes when you can have this kind of magic at your disposal?